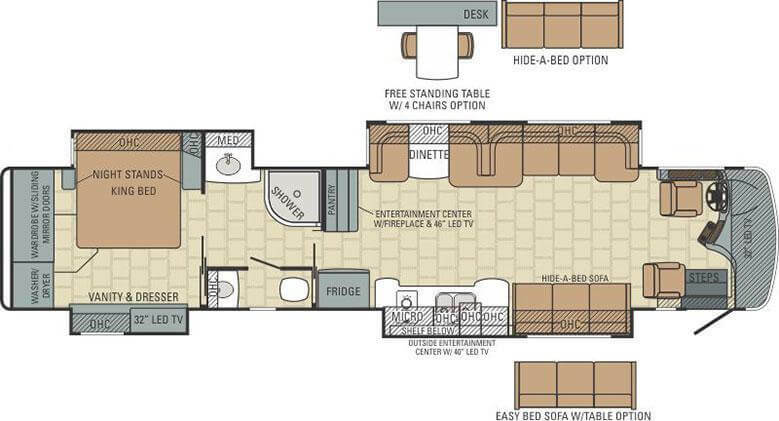 Exceptional craftsmanship, the Entegra Class A motorhomes can boast an array of outstanding amenities: hand-laid porcelain travertine floors, Amish-handcrafted cabinets to a gourmet kitchen, plush leather seating. 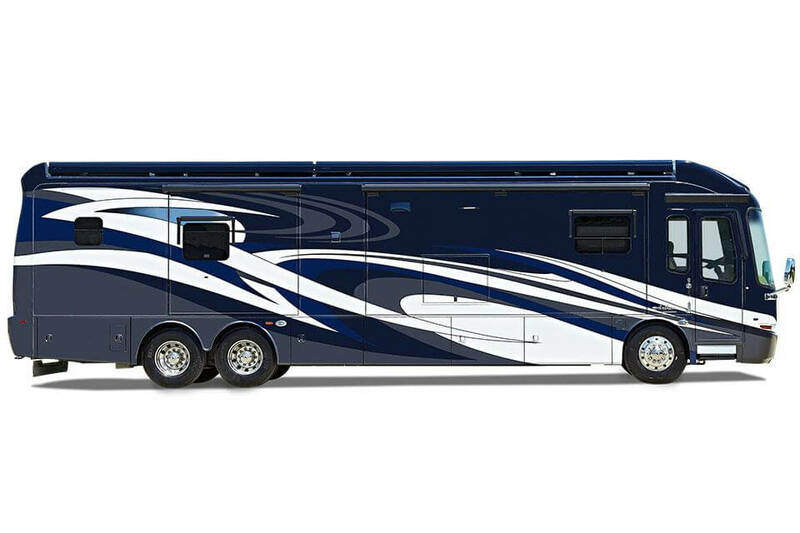 The well-thought-out interior design of the coach, and in part is due to the fact that the 44SL is as big as they come at Entegra, sharing its 43-foot, 11-inch length with a pair of other Anthem floorplans as well as its three Cornerstone-class cousins. 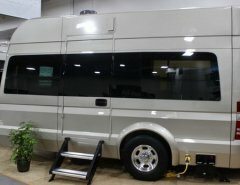 And, like every Entegra coach, it rides on a Spartan chassis, powered by the same Cummins ISL 450-hp turbodiesel used throughout the Aspire and Anthem lines. The exclusive Entegra Coach X-Bridge frame provides superior structural support, while the standard Cummins® turbocharged engine ensures a smooth, powerful ride. 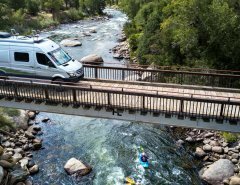 This division of Jayco’s motorhome group is unapologetic for the fact that it’s coaches aren’t always designed for families. From Entegra: “A 32-inch LED HDTV is located for easy viewing from the king-size bed. There’s plenty of room inside, to be sure, and the sofas in the main cabin convert to accommodate weekend guests — but our market really tends toward couples.” The 4 seater dinette tends to be a bit snug, but for 2, is ample space and pivots toward a huge tv and entertainment center. 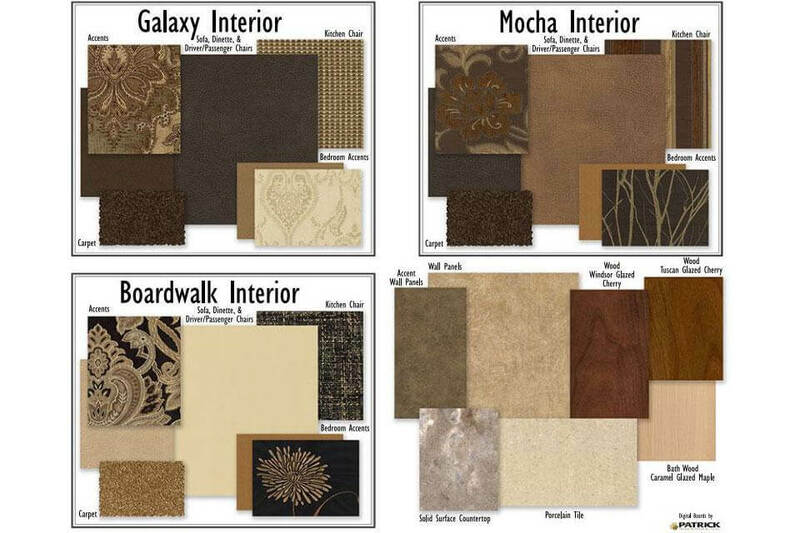 Entertainment, is key for this model and it’s 5 floorplans. One of six models in the Anthem line, the 44SL features a traditional rear bedroom suite arrangement with a mid-coach bath. Many of the differences between Anthem floorplans, in fact, revolve around changes to the bath configuration. 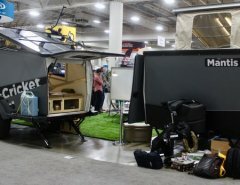 A bath-and-a-half style, the placement of the water closet or, a choice of single- or dual-lavatory sink setups along with two primary configurations in the main cabin. The 44SL is the only model to include the main bathroom lavatory/sink in the forward part of the rear streetside slide housing the standard king-size bed (there’s a second, smaller sink along with the toilet in a curbside water closet). Like every other Anthem in the lineup, the 44SL features a four-slide out arrangement. When open, the slide outs dramatically increase the 44SL’s square footage, but even when closed there is still room to walk through the coach, visit the bathroom, or even spend time in the bedroom watching your tv. The Anthem has all the bells and whistles you’d expect from a luxury coach of this caliber and price point: solid-cherry cabinetry, satin-nickel fixtures, solid-surface countertops, porcelain-tile shower, an Aqua-Hot 450 hydronic water and heating system, remote secure coach locking, a washer/dryer combo concealed behind one of the bedroom suite’s cabinet doors alongside cedar-lined wardrobes.